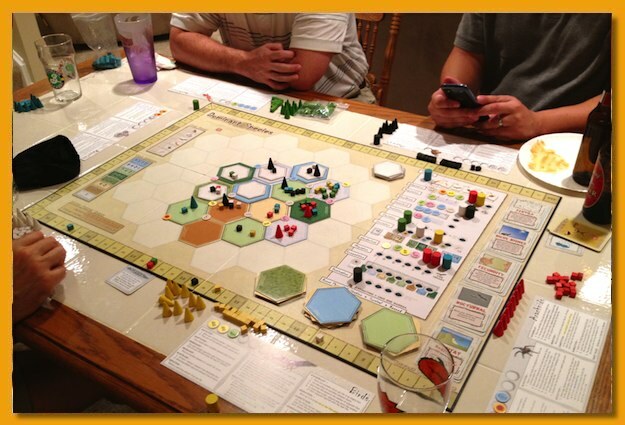 Six of us gathered for our August meeting with the informal plan of splitting up for some shorter games but in the end we pulled out Dominant Species…the full game. 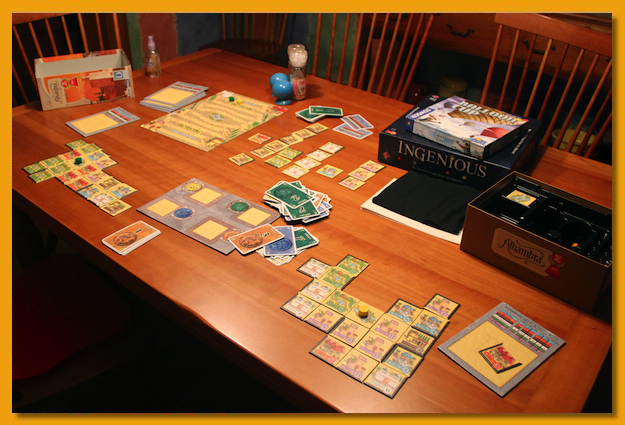 I’d brought DS:The Card Game but we opted for the full glory of the board game. We trudged through a rule refresher and by the second turn I’d realized I’d forgotten a lot from my first play and felt that it was going to be a long haul given that I don’t think my brain was ready to engage at the level necessary to be competitive. There are so many things going on in the game, and it’s difficult to choose wisely for your measly three action pawns (when playing with six). The chaos of the first few cards completely wiped out one player and dealt severe damage to my species. Clinging on for dear life through the mid-game I found myself fighting many land battles and you know what they say about starting a land war in Asia…. The first few rounds were flush with cow heads leaving the monkey-man strongly positioned for a tundra take over. By game end, very few water or grass tokens were on the board and I ended a distant 4th. If that doesn’t sound too bad, you’ve got to understand just how distant we ALL were behind the monkey man. I’ve I’m not mistaken he’d lapped us TWICE. Yes, you read that correctly, twice! Nobody could weaken his position on the tundra tiles and in retrospect we should have launched a group effort at dethroning him but we were all too interested in keeping our own little weakling species alive. I play poorly but I must admit, I still really like the game. I recently picked up a third printing (still in shrink sitting right next to me) and I don’t regret that. The game takes a significant portion of your evening to play (with six it took us four + hours but we play very slowly) so expect to set aside some time to play. Whew! It’s been a long time since I posted. There’s been a lot of non-gaming going on in the Marquand household including a short, but much needed, vacation. 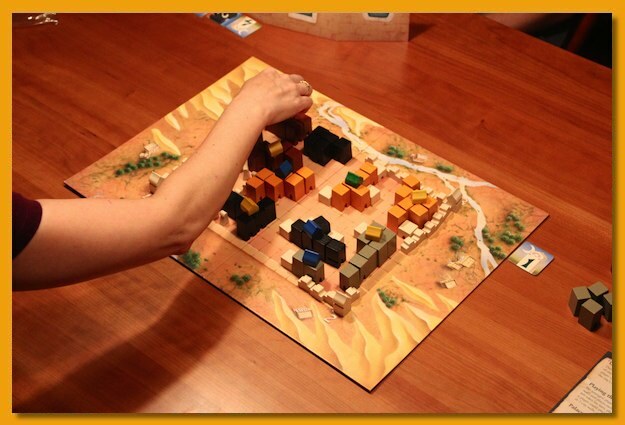 Lisa and I got in another game of Kingdom Builder and I think for both of us now, it’s become a game where you engage the auto-pilot and just let it run. I’ve played the game approximately 20-25 times and even with the Nomads expansion it’s starting to wear thin. It’s not that I don’t like it anymore (I’m still willing to play) but that I feel I’ve explored it to the best of my ability and willingness to expend any more effort. 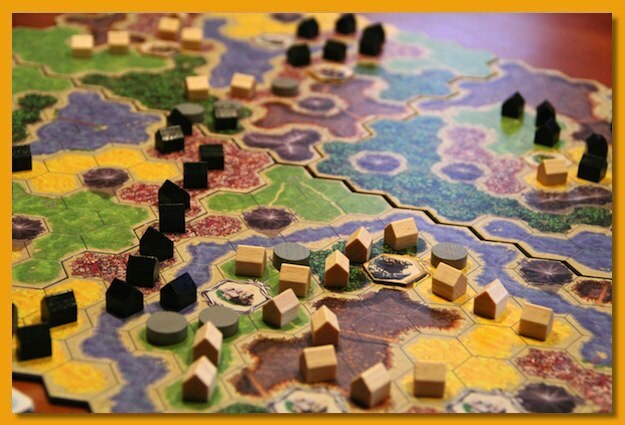 We are still getting some good mileage out of Samarkand: Routes to Riches. 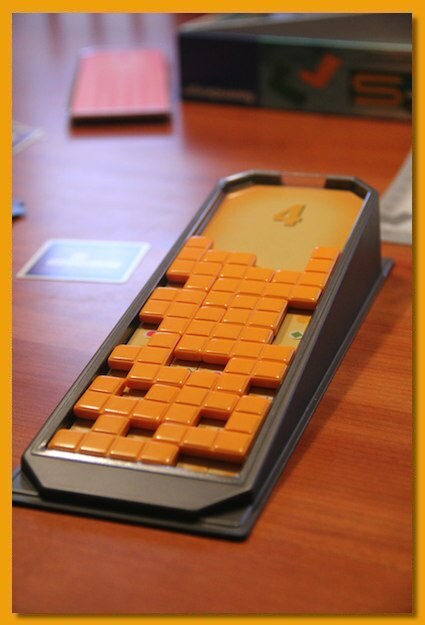 We played it with five at a recent gathering and it was a lot of fun. It plays very easily and almost on autopilot but there are still some nice decisions to make and rarely do you feel totally locked into a losing position. I blew the dust off of Ticket to Ride 1910 and we played three games back to back. 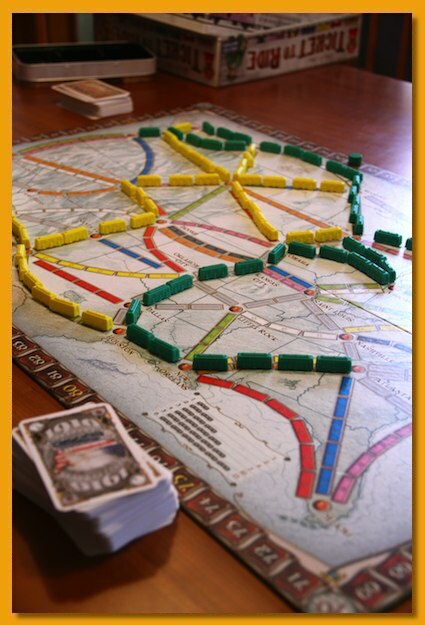 Ticket to Ride is still a great game in person and even on the iOS platform. If you haven’t ever played it, or are thinking of getting your first family game you can’t do much better than Ticket to Ride. 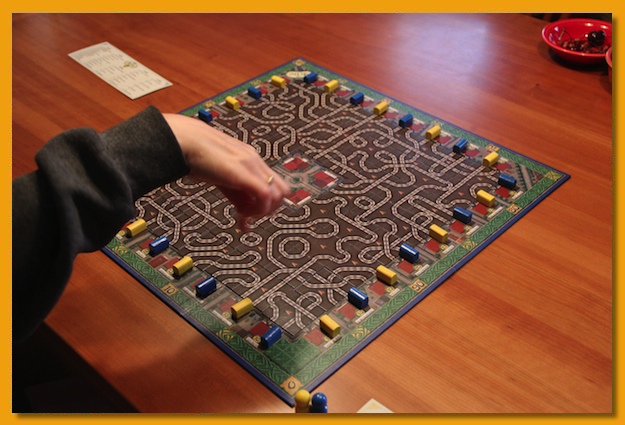 We didn’t have much time for gaming on a Saturday afternoon so I grabbed Metro and the two of us snaked the lines throughout the board trying to score points. It’s a bit of a mechanical game with a lot of just taking your lumps given the tile(s) you’ve drawn but it’s an okay activity to pass the time. 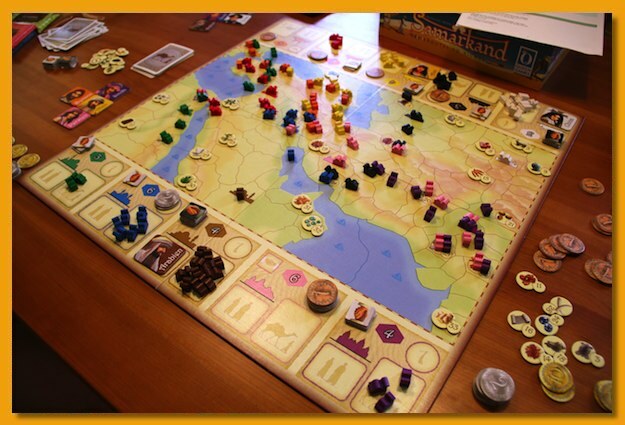 We conned Noah into playing a game of Medina with us one night and after a somewhat painful game of analysis paralysis we made it through it. If you can keep the pace up the game moves along nicely but if it bogs down, you’re in for some mind numbing downtime. I pulled out Ingenious and after three back to back games and another three the following day, I think you can say it still holds some interest in Lisa’s eyes. She even played a game or two solo which I’m not sure she’s ever done. We played a quick couple of games of FITS. 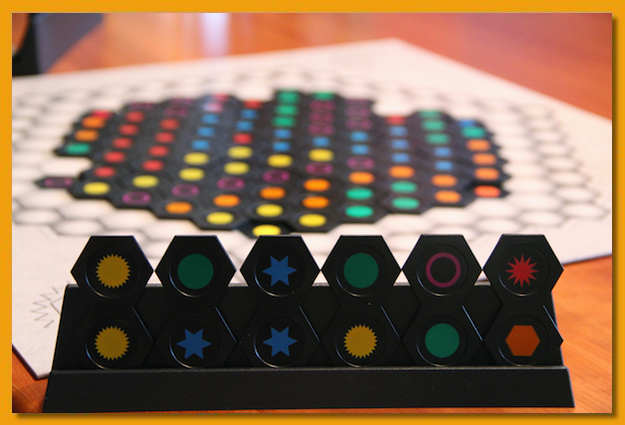 The game is basically plastic Tetris with some alternative scoring rules for what you manage to cover and not cover on your “board” over the course of several rounds. We usually don’t really keep score but just play a round, announce scores, grumble about silly plays or bad tile draws, and then start the next round without a score. It’s a fun activity that allows some wind down time for light conversation. We also slipped in a couple of games of Alhambra. We’d never played with two but it works relatively well. There is a dummy third player that grabs tiles blindly each round and in our games, that player was VERY strong in several high scoring tiles making Lisa and I fight for the lower scoring dregs. 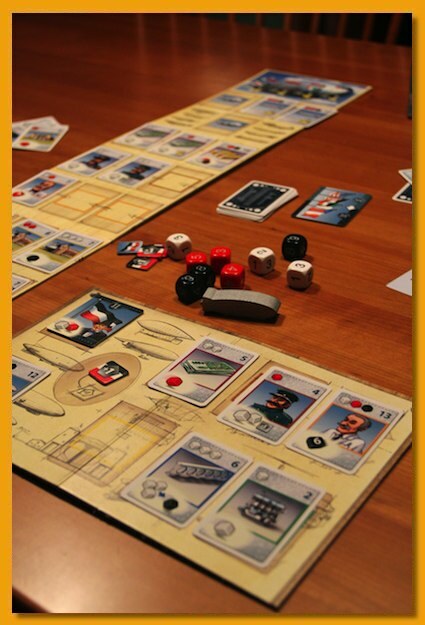 I traded a copy of Alea Iacta Est for a copy of Airships and after a couple of plays I’m happy with the trade. It’s not something I’d necessarily grab to play over lots of other games in my collection but I certainly felt I got the better game in the trade.